Photographing trains at night in New England I'm left with the feeling many nights, that I must have driven through an invisible, (to us earthlings) portal in time, while inside it the universe winks, and out the other side I come, to nearly empty roads, Coast to Coast AM host George Noory providing company on the radio, arriving in neatly compacted villages, their inhabitants in dreamland, I come across the railroad. Picking out a spot, I emerge from the car to silence while I set up the lights, hoping to photograph a passing night train. New England's "big" power, (excluding CPR's D&H, operating down the west side of Lake Champlain in New York) are SD 40-2's and the last group of C30-7's in the U.S., four axle GP 38's and GP 40's dominate on VRS and SLR rosters, locomotive models long since retired or relegated to the confines of yard duties elsewhere in North America. 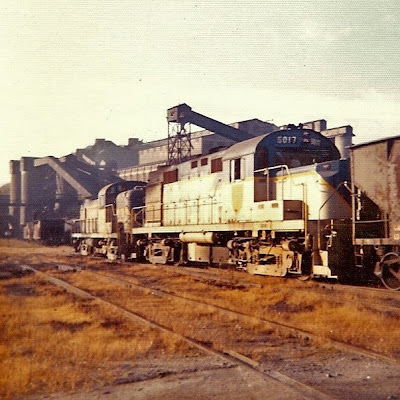 So after viewing what other railroad shooters are producing on the net, I often get the feeling of traveling through one of those time portals, to emerge back in time when the regions locomotives were the norm, and new, country wide. Last evening was another great example, with big plans after the heavy snowfall on the SLR route in New Hampshire to photograph SLR 393/394 plowing through the deep white stuff, I was all set to depart from the compound, when I found myself waiting for the car to warm up, (not a normal activity for me at night when I'm looking for "a" train) the computer, left on, "dinged" announcing an e-mail. Impatient now to get on the road, I glanced at the message, from my friend Frank Jolin, bringing news of a plow train running to Farnham, Quebec from the east. Not an everyday event! Was I glad I waited around! Arriving in Farnham two hours later, empty of people, I found an MM&A employee walking up out of the yard, and asked about the plow train.........and the universe winked, after a radio conversation, he relays the info that it will be here in an hour! Now, I used to shoot at night here in Farnham years ago when I first began practicing, in admiration for the de-turbocharged ex-SP GP 35's Iron Roads operated at the time. SO I recognized the snowbank! Ha,ha,ha! I set up eight flash units, leaving four unused, keeping in mind we're only lighting up a plow and engine, when my set up was noticed by an employee emerging from the station, who asked the obvious question. Even in french, I could understand the questioning tone of his voice, and I finally communicated "plow train" across the tracks to him. He shook his head in a more obvious (to me) no! "To shop.......to shop" he replied. Knowing fully well what he meant, the "shop" resides in the yard to the east, out of sight for a photo. I walked around to him as he got on the radio, and I thanked him profusely when, after a conversation, he shook his head in a "yes" to confirm in broken english they would come "here", pointing to the track in front of him. "Five to eight minutes" he reminded me before walking away, leaving me in solitude within this familiar setting. Shortly afterwards, "the universe winks" as the odd headlight of snowplow VB-101 emerges from the darkness at the west end of the yard, and the plow train drifts down to a stop in front of me! What year is this? A wood body plow built around 1920, pushed by a B23-7, from a class of the early eighties, (being generous) in front of Farham Station! 2009? 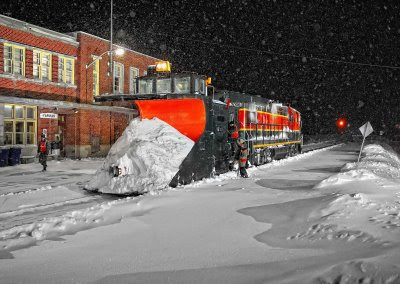 I happily click away, full of gratitude for the scene provided me as the men unload and "tinker" around the ancient plow, the engineer walks down the platform towards his car, and hollers across to me, "you're just as crazy as we are, out at this time of night!" I smile broadly and nod, thinking how railroaders are the nicest people. Shot on February 24, 2009 at 00:55, with Canons 5D and Zeiss ZF 35/2 (Nikon) lens set at f2.8. One flash erased behind the plow in photoshop. Many special thanks to "SIR" Frank Jolin! Please enjoy! Comments are welcomed. Jeff Rice and I on SC-2, the Ti Job. My Dad took the photo. Stopped at the old Whitehall Station for coffee at Citgo, no doubt. Checking the engine numbers against my old time books it looks to be Apr of 1990. Republic Steel Plant, Mineville, NY (Port Henry) fall 1972. 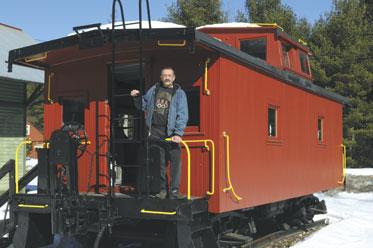 Tony Bucca is on the right track, he just needs more people to get on board.The Greenfield resident is leading efforts to restore the 1920s-era caboose at Kings Station Historical Park, at the corner of Route 9N and Porter Corners Road.Tonight at 7 he’ll give a presentation to Greenfield Historical Society about work done to date, what’s left and how people can get involved. "The caboose has been completely refurbished," Bucca said. During the past two years, he and other volunteers stripped off old exterior siding, some of it scorched in a fiery 2006 crash that claimed the life of a local man who ran off the road and struck the caboose. Now the outside has a shiny new surface and custom-made gutters to prevent water damage, and all the iron work has a fresh coat of paint.Next, he wants to spruce up the interior where conductors and other railroadmen lived and worked.“A caboose was really like a rolling office,” Bucca said. “They had a coal stove. They would do all their cooking in there, get in out of the weather.”Such cars were always attached to the end of freight trains. From there, conductors could keep an eye out for problems the engineer couldn’t see from the locomotive. The most common situation was smoking hot boxes, a compartment on train wheels where bearings were housed. Boxes were packed with waste cotton material and soaked with oil to lubricate bearings as wheels turned.Occasionally, material would wear out and have to be replaced, so the conductor would signal the engineer to bring the train to a halt.“That was one of the more important functions of the caboose,” Bucca said.By the 1940s and 50s, roller bearings came into use that eliminated the smoking hot box problem. As time went by, hand-held radios came into use so cabooses weren’t needed anymore.The town of Greenfield purchased its caboose from Delaware & Hudson Railway in 1988 for $1. It had been idled on an old rail spur in Corinth and was brought to its current location on a large flat-bed truck.Bucca has taken painstaking efforts to make sure restoration efforts are historically accurate. From Cooperstown and Charlotte Valley Railroad records, he found old stencils to see how exterior lettering was done. That’s one of the jobs he’ll be working on this year.In addition to the caboose, volunteers are also turning the old Kings Station into a museum. The depot was originally located a short distance away, right along the tracks, but was moved to its current site some years ago.Town Historian Mary DeMarco has already created a rail-themed display inside the old ticket office. 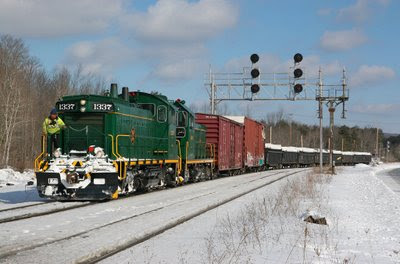 Future plans call for converting the freight office into a small museum highlighting things such as Greenfield’s agricultural and logging history.The line, opened in 1885, was first known as the Adirondack Railway and carried passengers from Saratoga Springs to North Creek. From there, they would travel by stage and boat to vacation destinations such as old hotels and Adirondack Great Camps, the summer homes of America’s Gilded Age rich and famous.The D&H purchased the line in 1901. 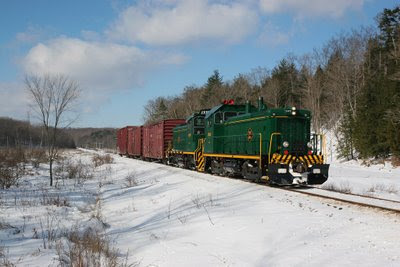 During World War II, it was extended north to Tahawus where ilmenite ore was mined to make titanium for military purposes.Most recently, Upper Hudson River Railroad has been using the line as a tourist attraction. 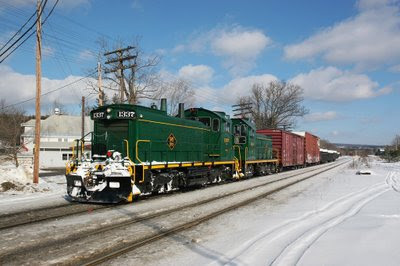 Currently, trains run from North Creek to Corinth; it’s hoped, with proper improvements, that they’ll eventually reach Saratoga Springs.Bucca would like to see trains stop in Greenfield, giving passengers a chance to see the caboose and old depot. 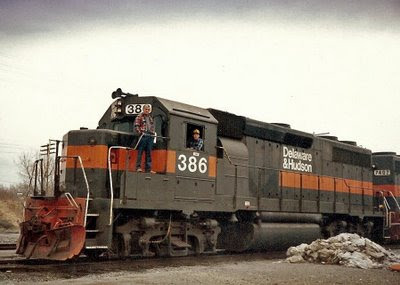 He’s even chairing a group named Citizens Restoring Our Caboose at Kings Station (CROCKS).A self-employed freelance photographer, he’s an avid model railroader and publishes a hobby newsletter that reaches 400 people from Syracuse to Massachusetts. If someone needs a favor, Bucca will usually lend a hand. If not, he always has a good excuse.“I’ve got to go work on my caboose,” he says, smiling. SNY made their weekly run down to Delanson to interchange with CP/D&H. Normally they use one engine. But due to a large cut of heavy cars they instead ran down with two units, one of which was recently repaired after having a major failure. Here are three shots. Couple at Delanson, NY on CP with their interchange in tow. Another at Schoharie Turnpike on the Albany Main in Duanesburg with interchange from CP/D&H.